You may look at a garden hose, see the similarities and think they are built equally. But the opposite is quite true. Choosing the best garden hose is hard. Even as they coil and uncoil; these gardening tools can be pretty hard to pick. There lots of considerations which go into picking a garden hose. You’ll want to consider a few factors including the length, materials, and internal diameter when choosing the best garden hose. In the assumption that you don’t want to replace your garden hose before the first few years, we scoured the market and found the high-quality brands which make all the difference when working with a garden hose. These models are not only the best, but they carry exceptional features for maximum performance. The local home improvement store may seem like your best first stop when looking to purchase a garden hose. But when you don’t know what you are looking for, the trip may take longer than you’d love. Walk with us as we guide your next choice and let you know what you are looking for exactly. Coil hoses– these are the standard hoses which unravel during use and coil back into a compact shape after use. They exhibit durability properties since they are less prone to developing kinks. Expandable hoses– just like the name these hoses expand when water runs through them and collapse after use. They are lightweight and easy to store. Most gardeners love their small nature, but they may lose their ability to expand and collapse after heavy usage. Soaker hoses- you’ll spot this type of hose with its signature holes which allow water to seep out slowly and steadily. It is longer than most hoses and is the best pick for watering plants. Flat hoses– if you have observed firefighters, their water hoses take a round shape when in use and then collapse to a flat shape. They can fold flat during storage. It’s the same case for a flat garden hose only that it is a smaller version of the firefighters. The most common diameter for homeowners is the ½ inch diameter garden hose. But if you have a concern with the pressure you’ll want to look more into the diameter of the backyard hose. For light-duty tasks where you don’t need to go around trees, the ½ inch diameter is a good place to start. It is the best ideal for small gardens. 3/8 inch hoses are next in category but are usually a rare find. The pressure is higher than the ½ inch hoses but is also ideal for heavy-duty tasks. The next in line is the 5/8inch hoses. These models are longer, with higher pressure and can handle heavy usage. Lastly, we have the ¾ inch hoses. These designs have the highest power and as such tackle the most substantial watering jobs. You’ll like them better if you a commercial landscaper. It is frustrating for a hose to crack before it has completed a few years of use. To avoid all that heartache, look into the materials that make your garden hose before purchasing. Before technology was a thing, hoses usually had a construction from rubber. But with advancements, you can find them in vinyl, polyurethane, and others in nylon. 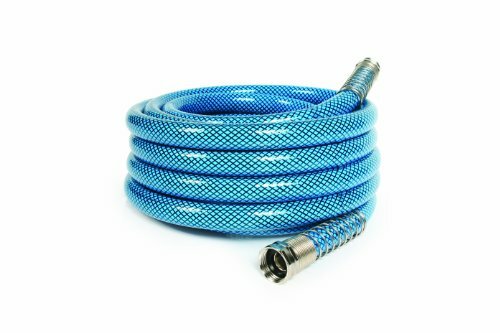 This is a trend for best garden hose. Rubber– This material is the best for garden hoses. It is not only resilient, but it can also carry hot water. It is less likely to develop a kink or even puncture. This convenience comes with a hefty price tag, and you’ll also find them heavy to haul around the garden. Vinyl– This material is lightweight and easy to carry around. In many cases, it is reinforced with rubber to make it sturdier while retaining the lightweight properties. It can handle an average workload, and the price is very reasonable. Nylon-Most people identify this type of hose by the flexibility in that they collapse flat when they don’t have water in them. Polyurethane-This is another rare but high-quality find in garden hose materials. The most common types carry the label food-grade polyurethane to mean they are safe for drinking water. The problem with rubber and vinyl is that it can leak of toxic lead. The end piece which attaches to your sprinkler spigot or nozzle is the hose coupling. It’s important that you avoid plastic connectors since they are prone to breakage. They cannot also stomach high-temperature difference and are hard to tighten. Brass couplings are the most common, but even these can be imitated. Look for the classic octagon or hexagonal shape in brass couplings. It can be stamped or cast but all the same metal. Brass couplings are seen in heavy duty hoses like in rubber. They are easy to turn and twist with a wrench or your hands. They are also very durable. Aluminum couplings are stronger than plastic but cannot match up the strength of brass couplings. Instead of investing in a hose with a plastic coupling, in the long run, you can save yourself some dime with this type of fittings. In this line of gardening, we always say, longer does not always mean better. Identify your need before investing in a garden hose because of the length. It is a rush towards balancing the pressure and the length. The longer the pipe, the lesser the pressure is. So if you are looking at a long hose, you may want to identify if it is ideal for the area you’ll be covering. Watering your flowerbed is not always an exciting affair. At least not to most of us; but when you see the flowers blooming with life, you are happy you put in the work. What better way to ease some of that hassle than with a garden hose which gets the works done fast and effortlessly. The Fitlife Expandable Garden hose packs in the diameter and length combination for the best performance. This hose comes with internal latex layer which makes it strong enough to withstand heavy usage. You’ll love that because it expands and collapses as it runs water through it, it does not have to go through the stress of coiling. The ¾ inch diameter makes just the right pressure to prevent bursting. It does not even have the chance to develop a kink because of the collapsible aspect. Not to mention; it boasts around 1200 uses. The FitLife hose is furnished with brass coupling. You’ll enjoy tighter attachments to the sprinkler or the spigot you use. You can even use a wrench, and it turns well in smooth successions. It resists breakage, cracking and even leakage. Save yourself some water bills as you’ll also find in the same excellent condition when you connect it. Is not nice having to work with a hose that only weighs 1.8lbs? This means it’s easy to store; hence you’ll not waste time dragging the hose from one end of the home to the other. It can expand to three times its size and extends to 25 ft. It is, thus, suitable for light-duty tasks. 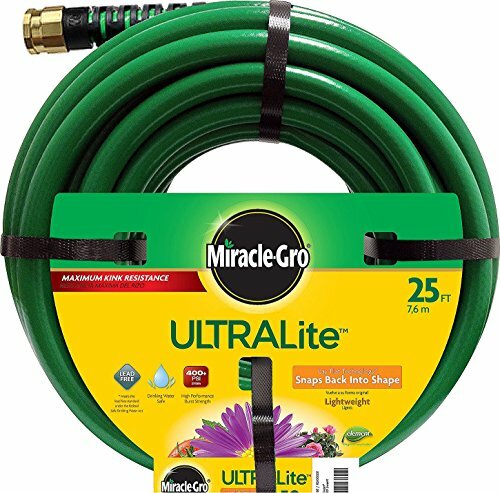 This is a great garden hose for the money. The pressure and distance are perfect for small gardening work. For those who have weight lifting restrictions, this is the hose for you. But if you have more to accomplish, you may want to look elsewhere. The Joeys Garden Hose enjoys some of the best properties in a homeowner’s garden hose. It is an expandable design which lets you use it without tangling, kinking or bursting. It can work with most of the water pressure from the smallest at 60PSI to 115PSI. This means it does not collapse when the water is at a low pressure or stretch excessively to the point of bursting when the pressure is high. This is a versatile hose since it can accomplish many tasks. It has a ¾ inch diameter with a 50ft length. This way you can take it across your garden to wash your car, water your hedge, flower beds plus a line of other tasks. It is an essential tool for accessing all the tight areas around your home since it is lightweight and steady. You’ll not feel the pinch of fatigue after many hours of use. Although some hoses come with substandard nozzles, we must agree that the Joeys is equipped with the best injector system. It can achieve eight patterns so that you can accomplish many needs. You can go from the traditional shower to the mist, stream and the like. If gardening seems like a task, let this garden hose change the way you feel for better days. 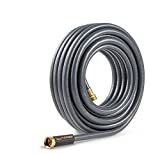 This garden hose is fashioned with heavy duty fittings including brass connectors. This aspect means it can take on different water fittings with ease. You’ll also love that all the other parts of the valve, spray, and nozzle are all from durable materials. Joeys’ intentions are to make life easier, and they prove their point with this hose. It has a long length to the liking of most people. The weight is manageable, materials are durable, and it has a sturdy exterior. It is also not ideal for commercial jobs. 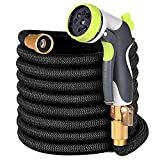 Are you looking for that garden hose that you can just grab and be in the garage cleaning the car or just give it to your son to wash the dog? If so, it’s time you look at the VicTsing Expanding hose. This is an exceptional hose in that it is built to take heavy abuse and remain intact. The exterior is tough polyester while the interior is robust latex. You are assured of durability when you choose the VicTsing. This hose has brass fittings and premium quality valve. It is deemed to take you through all year, and it still retains the perfect working conditions. It takes on different water pressures without showing any stress signs. The expandable design means it has a small weight; hence you’ll be able to lift it and exempt it from dragging which may degrade its quality. The VicTsing expands to three times its original size. This gives you the chance to work with a unit that works for you. It allows water with different pressure to run including a high of 130PSI. You can depend on this hose to deliver water to 50ft, and with an increased pressure it can shoot the water further so that you are not watering just one position. When this hose retracts, you’ll find that it weighs only 2.4 ounces. Along with the ability to discharge water out fast, it makes it easy to carry from one location to the next. You’ll love that it comes with the storage bag which also makes it useful want to move or travel with it. For most of the features, the VicTsing does what it says it shall do. The water pressure is sufficient for most jobs. The pricing is quite fair as it is durable, compact, and performs exceptionally well and it can easily be named the best garden hose. Once in a while, the thirst for drinking from a water hose gets the best of us. What we don’t realize is that some of these hoes carry toxic elements. Unless it passes for safe drinking water like the Miracle Gro, it is highly advisable to keep off. It is lead and phthalate free; hence absolutely safe even around children. This garden hose is not only useful for drinking water, but it’s your go-to for all water gardening needs. It delivers water to a great distance of 50ft. Seeing that it has a burst strength of 400PSI, it can last long since it does not get damaged after numerous uses. The construction of rubber and vinyl keeps it sturdy against kinking. The Miracle Gro has aluminum couplings which can withstand the force of other yard maintenance equipment. If you have the tendency to forget the hose outside, don’t shudder at the thought of a car rendering it useless. Thanks to the aluminum make, your hose will be as good as new in the morning. Only don’t make a habit of it. Miracle Gro presents a product in a thoughtful design. The implementation may have come short a little bit, but the overall performance is perfect for light duty tasks. It is ideal for drinking water, plus the durability is hard to beat for hoses its class. When we talk about an all-around garden hose, we are talking about the YEAHBEER Expanding model. It couldn’t have come at a better time when homeowners are striving to acquire reliable tools which do not require frequent repairs. This hose is strong, durable, and sturdy. The YEAHBEER features a 5,000 denier outer wrap. It grants the hose durability properties which see it through the toughest tasks. It is the kind you don’t mind tagging on rocky paths since it can maintain its superior construction. With the elimination of seams in the design, it ensures that the hose takes on pressure without threatening a burst. The ¾ inch hose comes with copper fittings. Finding a hose with copper fittings is lucky. This is because brass is superior and the chances of wear are next to zero. As a high-pressure garden hose, it can take withstand heavy usage for a decent time. It is also fashioned with steel clamps. They are indestructible so that it can come out intact if any equipment crashes on it. After expanding to 75, you can fold it into a compact size for quick storage. This way, it saves you from wrestling with a heavy hose which can leave you exhausted. The length also makes it possible to work on many tasks effortlessly. The YEAHBEER is another excellent design. We love the implementation which makes your gardening activities much easier. With the brass fitting, 5000 denier wrap and even the flexibility properties, you can tell that this tool is going to be around for a long time. 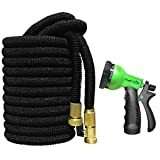 The GrowGreen expandable Water Hose is a unique model. Unlike many brands, this one meets the standards we expect in an averagely sized garden hose. The latex interior materials stand the test of great water pressure, and it retains its best working condition. Thanks to the reinforcements done to the structure; it can take on 145PSI pressure. You don’t have to worry about bursting each time you get it secure on a faucet. You’ll enjoy working with a hose that can bend, coil and recoil with very high pliability. It will never kink, twist or tangle. When you are done using it, the hose collapses neatly into a subtle size. This way, you don’t expend any energy during storage. Better still, when it’s time to use it the next time, the hose comes in the same new condition. Perhaps the aspects that define this garden hose are all brass connectors. It does not factor in other metals which may lower the quality of the brass. It can hold on to its shape for many years since it is thick and also resists corrosion. It does not go flat even under crushing pressure. These fittings are also easy to attach to faucets since they do not stick when they become wet. This hose offers a comfortable working length. It is not heavy like rubber hoses, but it saves you from fatigue from pulling on a heavy pipe. It is the best for persons who have weight lifting restrictions. It gets better with the eight nozzle patterns. You get to experiment with many styles to fit your gardening needs. The flow is also easy to control with the included shut-off valve. 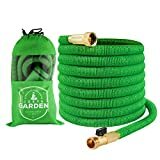 Gardening gets better with the GrowGreen hose. It is ideal for medium duty jobs. The convenience of this garden hose is in the incorporation of layers of latex to improve the longevity. The use of brass is also very admirable as you can count on it to hold on to the faucet without leaking. It is just not the best when you require longer than 50ft working length. Many manufacturers may claim that their hoses are kink free when it comes to vinyl and rubber hoses. 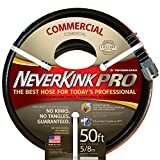 But the NeverKink is proof that you can buy a kink-free garden hose. It has mesh reinforcements which counter any signs of kinks and tangle developments. You’ll love the comfort it provides when tackling heavy duty tasks. The NeverKink is perfect for tough jobs since it has a 5/8inch diameter. 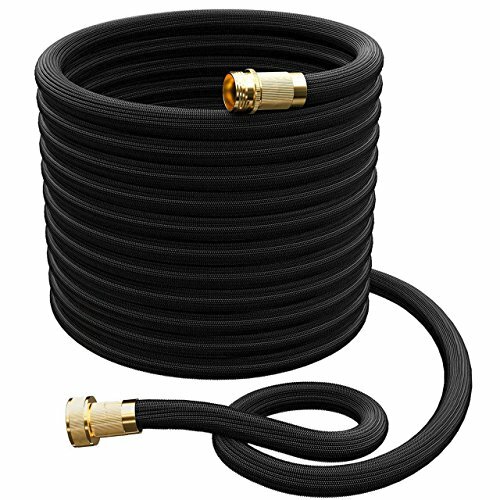 It is typical of heavy duty rubber hoses which are intended to perform with excellence when it comes to watering plants or even emptying swimming pools. It is the best in the drought months when you want to maintain a lovely garden with colorful roses. And if you have a commercial botanical garden, this hose will come through for you. Aluminum makes the connectors seen on this hose. These couplings are lead-free making it safe for drinking from. Aluminum is known to resist corrosion plus abrasion. With it, you are assured of longevity in the ensemble. Thus it provides real value for the money. Coupled with a power coil; it can comfortably prevent the slightest occurrence of a kink at the faucet. This is not your occasional garden hose. Contractors and landscaping enthusiasts pick this tool for a reason. It can take many attachments including chemical sprayers, nozzles, and sprinklers. It is beneficial for daily maintenance tasks. What’s more, it bears a micro-shield which prevents the development of mildew and mold on the exterior. This is what we call the typical garden hose for heavy-duty jobs. From the free-kick system, longevity features, and leak-proofing, the NeverKink is a total steal. If you an avid landscaper, you can’t afford to miss on the great properties showcased by this hose. And, it’ available in other sizes and lengths for those who’d love to enjoy the kink free aspects. When we talk of top-quality, we are definitely referring to the Gilmour. You can’t beat what this brand brings to the table. Take this particular Flexogen hose and leave out the market hassle. It packs the requirements that every homeowner lines up when looking for a garden hose. From the burst strength, length and materials, you’ll love every aspect of this hose. The Flexogen bears an exclusive construction which lets it through different weather conditions from winter to the heat of summer. Needless to say, nothing affects its performance throughout its life. It carries burst strength of up to 500PSI, so you won’t be minding the pressure of the faucet. It makes it easy for you to reach out to all the corners you want with the high pressure which increases the overall distance. This hose is unlike any other. It is equipped with a flow guard and protective spring. These two elements work hand in hand to prevent kinking of the hose throughout its length. This way, you skip seeking repair for your hose after storage. The nylon wrap plus foam are essential in keeping the hose flexible and in the process helping it to resist any kinks. The Flexogen benefits from heavy-duty, crush-resistant metal couplings. This means it can escape damage in the case a car ran over it. Besides, it has an O-ring seal which blocks and prevents any leakage. Better still it has eight layers to provide maximum longevity. To say the least, this hose is all-around by providing the best properties in a tool intended for the homeowner. It can withstand pressure from faucets while blocking any form of leakage. Working with it presents a reliable tool for all your water gardening needs. It doesn’t have the smallest weight for its diameter and length combinations, but it comes down to the materials that make it. 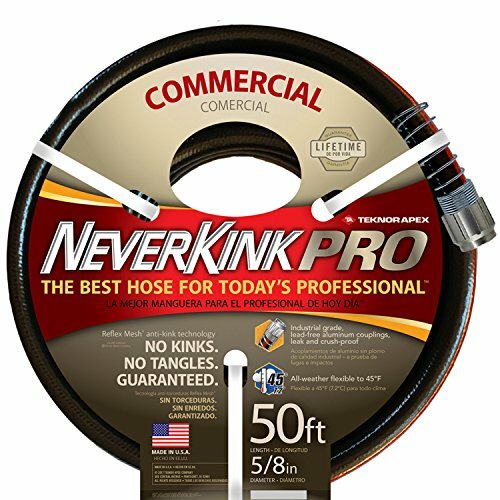 Many of us want a hose that will pass the kink test. But unfortunately, not many brands have mastered that art. We can say that the Flexzilla have successfully beaten the odd and it’s no wonder many people gravitate towards it. The making of this hose is a high-grade polymer which allows it to lie flat after use. This hose takes pliability to another level. With the help of the responsive polymer, this hose allows you to reach out to areas you would love the power that comes from the force discharged by the water. This flexibility also keeps it stable against recoiling and developing a kink. It also makes it easy to you when coiling after use as it does so in smooth progressions. It is not the kind you have to engage all your physical force to get it down. The Flexozilla is a real definition of what a subtle hose should look like. It only weighs 8pounds considering that it is from the polymer. You’ll be able to transport it with ease from one location to the other. 25ft is a good size for the average residential property owners. Besides, this hose does not retain a memory hence it will not twist during storage. 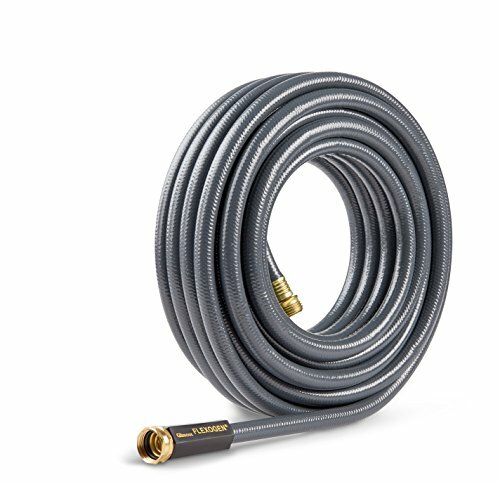 This hose has a unique inner tube with a construction from 100% safe materials. This means you can drink the water that comes from it without flinching. What’s more, it comes with crush-resistant aircraft grade aluminum to attain a secure connection with the faucet. It is always safe from leaking. Flexzilla performs much better than we would expect from a regular polymer hose. The overall construction is very sturdy. It can coil fast and easy plus the weight is very manageable. Moreover, it is safe to drink from it owing to the safety measures put in place in the process of engineering. Making it to our top position is the Camco Premium Drinking Water Hose. This model has undergone thousands of evaluation to garner a huge following and liking. We particularly love it because it eliminates all the toxic elements that can be found in regular garden hoses. It does not contain even the slightest hint of plastic taste in your water. We can’t fail to notice the longevity properties that this tool brings. First, it comes with nickel-plated brass fittings. These connectors are incorporated into the unit so that it makes a clean seal when you connect it to the faucet. This way, the chances of the hose leaking are reduced to zero. You’ll like that since brass is heavy duty, it does not easily corrode. This hose enjoys 20% more thickness than on standard hoses. It can withstand heavy usage while staying free of leaks and pin holes. It is also reinforced to remain flexible even under pressure. This means kinks are a NO when it comes to working with the Camco. The advantage of having a safe drinking water hose is that it opens up your choices to do so much with the water. If you farm organic plants, this is the hose for you since it BPA and Phthalate free. You can also water your livestock or wash your car and pets to achieve a sparkly look. The 5/8inch diameter is most crucial when making all these happen. The Camco excels in durability, performance, and safety. The price is very reasonable even when getting a lead and BPA free hose. You get to work with total convenience with an industrial grade pipe. It offers dependability for tough tasks. 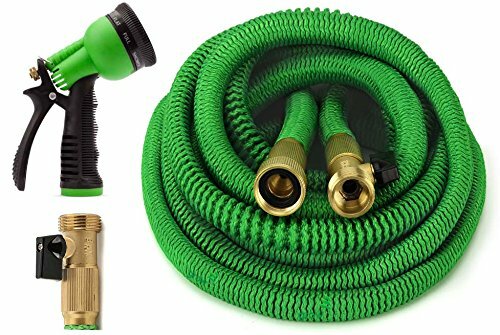 For the ergonomic and power combinations, you get the best garden hose for the money. As we went into the details of the best garden hoses on the market, it is our hope that you have figure out your next model. Remember what you want in a garden hose since this is not an area you’ll want to splurge. The designs in this list have proven their worth, and as such, you can count on them to get the work done. 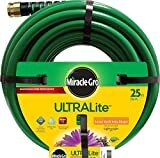 I hope you liked our picks for best garden hose and that yo liked them.